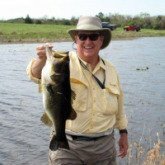 The original fishing lures we offered and our best selling lures to this day are tied on the Buggs Jig Heads. We started with the arrowhead shaped jig head, which goes by the name wiggle jig, slider, or skimmer jig. In keeping with our ideals, we upgraded the hook and made it the perfect size for inshore saltwater and freshwater fishing. I simply can't stand dull hooks, so we found the sharpest hook we could, a Mustad Ultra Point Black Nickel jig hook. We use a Size 2/0 for the 1/8th oz., a Size 3/0 for the 1/4 oz. and a Size 4/0 for the 3/8th oz. 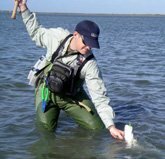 The hook is strong enough to handle inshore saltwater species and anything a bass can throw at it. Speaking of stealth, these guys land more quietly than anything on the market! For those calmer days and shorter casts, we offer our Buggs Jig Heads starting at 1/8th oz. When you tie them up, especially when you tie with bunny, you'll get a little more weight to help you cast the jigs. But the lead is only 1/8th oz. For skinny water fishing, you can't beat it! The next sizes in our Buggs Jig Heads are 1/4 oz. and 3/8 oz. These heads are more versatile in a wide range of conditions, from sight casting to blind casting. 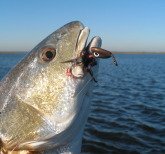 They perform well in skinny water, when it's windy, and when longer casts are required. You won't find more effective heads anywhere else, a prime example of our commitment to creating the finest jig heads on the market! Head to the Online Store and look for the Original Buggs Jig Heads tab. From the Texas Gulf Coast, through Louisiana, Mississippi, both the Florida coasts and up through the Carolinas, these heads have proven themselves in the most demanding conditions. Bottom line: What you have here are the most unique and effective shallow water saltwater and freshwater jig heads ever made! But don't just take our word for it, head to the online store and pick some up today! You can also find tying instructions for the Buggs Jigs so you can tie them just like we do!